Trekking in Ladakh & Zanskar: Which trek fits you? Are you planning to go for trekking in Ladakh but not sure which trek will be right for you or which area in Ladakh and Zanskar? And which trek is suitable for you and your stamina? We’d like to help you choosing the right one. Question No 1: How fit am I? Actually, this is THE question. Without knowing what you are able to do, it is for both, you and us, a difficult task to pick up the right trek for you. Someone who does hardly any kind of exercise at home will have difficulties going on a long and/or strenuous trek. In this case, it will be better to opt for a shorter trek or simply day hikes, which can be very nice as well. Someone who is very active and likes to spend as much time as possible in the mountains, will be able to undertake a long and/or strenuous trek in Ladakh. Usually, we ask our clients ahead on how many walking hours (without a break) they think they can do per day. This help us to select or to write an appropriate itinerary for that person. Question No 2: What is important for me on a trek? What kind of trekking do you prefer? Meet lots of people on the way with whom you can interact? Or do you prefer it to be a bit more isolated and meet as less people as possible? What landscapes do you prefer? Vast plateaus with a great horizon or valleys and passes with idyllic villages? Sham trek can be done by people who were lately not sportive, as long as they are able to hike for 3-4 hours a day. It is known as Baby trek, due to the fact that none of the passes on the way is higher than 4000m. Nowadays, the villages have facilities of home stays which are nice and economical. Though, you do not necessarily need a guide, as you can ask for routes to any locals. But to get closer to the locals or to answer your questions about Ladakh and its lifestyle, it is easier to have a guide around. And also, it will be easier for you to go on some detours. There is a road from Likir to Hemis Shukpachan. One must not walk on the road as there is a nice walking path mostly away from the road. The traffic is very less on this road. Due to the road, hiring ponies for riding/packing is not a quick process. Yet, if you intend to trek with your children it will be better to have a pony or donkey along. Many children have gone on this trek and have enjoyed it. You get to hike from village to village and explore the local farms and scenic beauty. The Markha-Trek in Hemis Nationalpark is one of the most known trekking routes in Ladakh. One of the reasons: it is close to Leh and therefor cheaper and the second reason: it’s beautiful, diverse in landscape, flora and fauna, hence attracts a lot of people. Markha-Trek can also be done meanwhile as Homestay-trek – But we suggest this option to those who are ok with basic accommodations and plain local food. 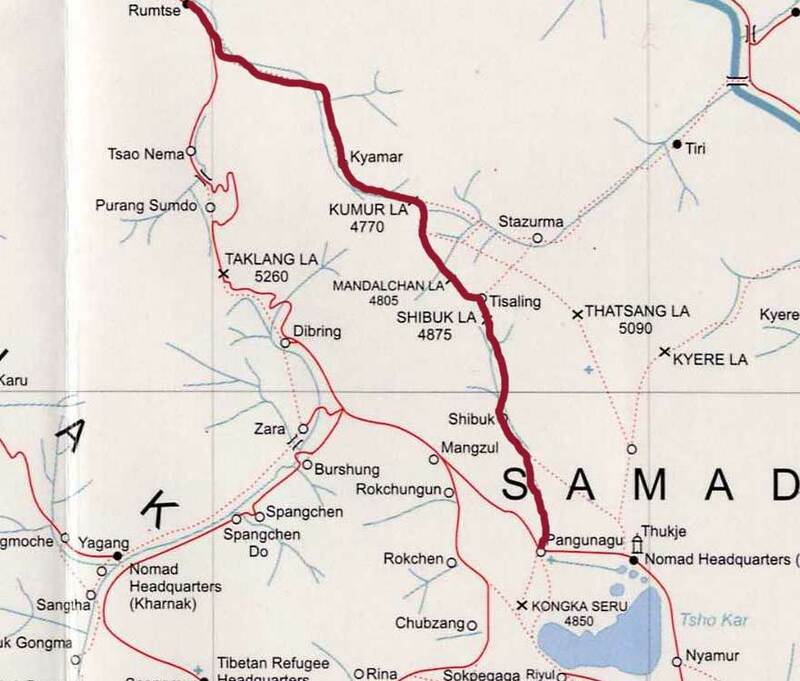 The people of Markha valley dreamt for quite a long time for a road connecting their villages with Chilling. That dream was fulfilled for a very short time before the young bridge was drown by a winter flood outburst, caused by an artificial lake formed on the Tsarap river due to landslide. Probably the replacement bridge on the river Zanskar will take at least a few more years, if not a decade. The classic Markha valley trek used to begin from Spituk, right from the bridge on the river Indus. Now, due to the road construction towards Rumbak and probably some day in the future to Markha valley, we begin the trek at Zhingchen, and hence shortened by one day. Similarly, on the last day of the trek: Instead of ending in Martselang or Hemis, many end the trek at Shang Sumdo village. 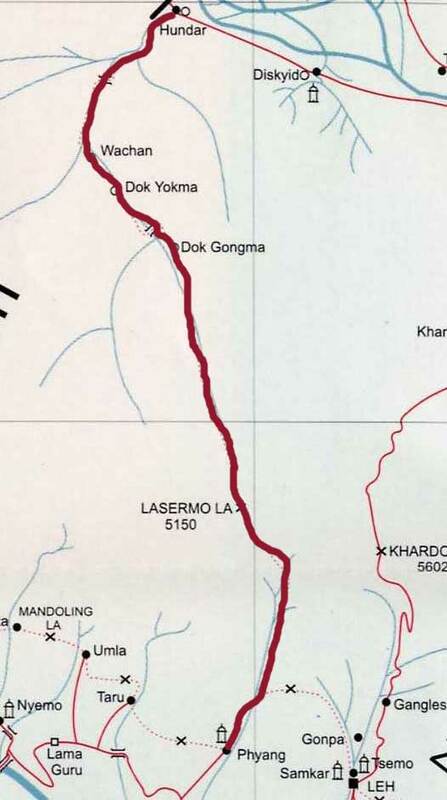 On this trek we go over two passes – Ganda La (nearly 5.000m) and Kongmaru La (above 5.000m). In order to cross these passes in high altitude, a certain level of fitness and acclimatisation before commencing the trek is required. We are not talking about the stereotypical super fit etc. but someone walking for few hours in non-gradual terrain at home and someone whose heart and lungs are in normal conditions. We did it with children (and with riding ponies). The trek from Hundar to Phyang connects the valleys of Shayok and Indus and is one of the most popular treks in Nubra. The north face of Lasermo La (5.400m) retains snow and ice throughout the year even though receding at an alarming pace. In some of the existing literature or with some agencies, the trek is suggested from Phyang to Hundar, but we certainly do not recommend the trek to be begun from Phyang unless the trekker is well acclimatised. The altitude gain is too quick from the south side (Phyang), whereas, from the north side (Hundar) you hike up comfortably and gradually towards the pass which reduces the risks pertaining to high altitude difficulties. This short trek introduces some of the remote and quaint little villages which are tucked away in the mountains between Zanskar and Indus Rivers. One of the villages still retains the remaining of the temple built 1000 years ago. 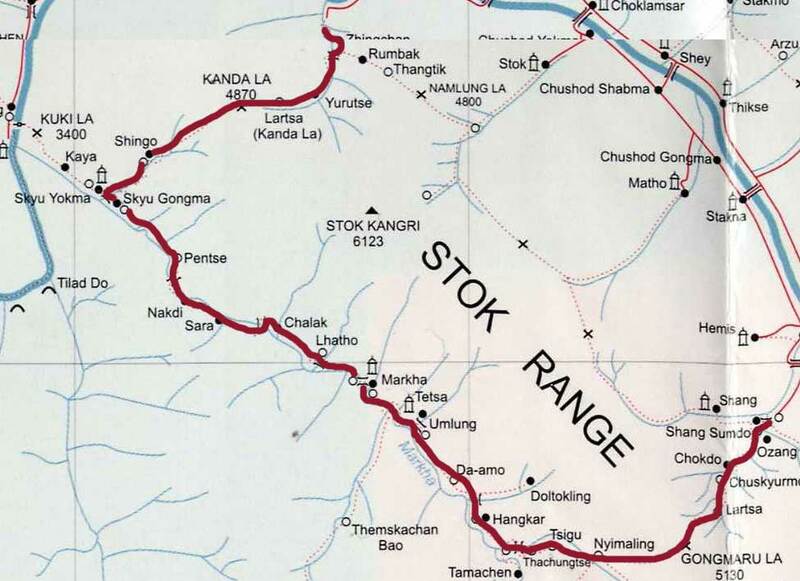 The trek can be extended into Markha valley and further east to the great lakes by simply crossing the Zanskar River which is meandering northward to meet the River Indus. 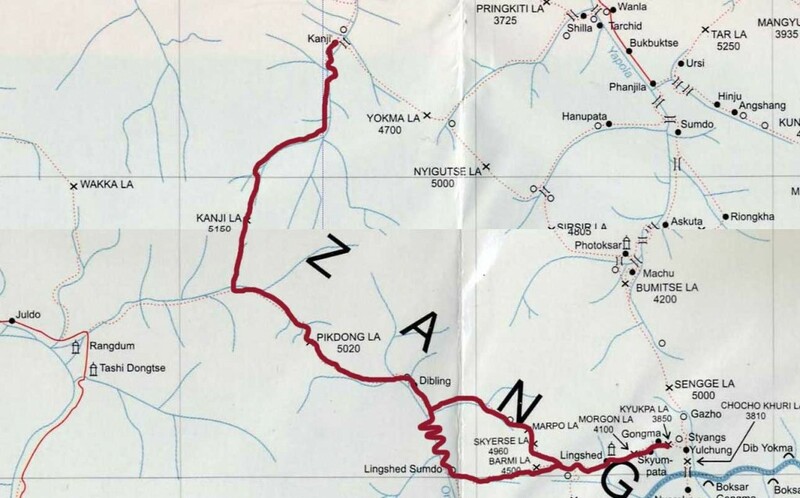 This classic route begins in Lamayuru and over Prinkiti La (3.725m) to Wanla, a nice start as it is not too strenuous. The newly constructed road with rarely any traffic, between Wanla and Hinju is unavoidable – unless we begin the trek in Hinju or detour to the small village of Ursi over a pass and barren landscape. Chilling, at the end of this trek is a village, where we still find the descendants of the celebrated metal smiths of Ladakh. According to a local lore some of these metalsmiths originally came from Nepal, probably Newari, who were brought by the King of Ladakh (Grags-pa-‘bum) during the construction of the golden Maitreya statue within the Basgo fortress. Rafting on Zanskar till the confluence with Indus is an option on the way back to Leh. This trip is almost entirely in Changthang, a part of the highest and the largest plateau in the world, the Tibetan Plateau, often known as the roof of the world. This piece of high land within Ladakh is home to the remaining Ladakhi and as well as Tibetan nomads who are still wandering the plateau with their animal such as Yak, sheep and THE goats who produce the expensive and famed wool known as the Pashmina or Cashmir! 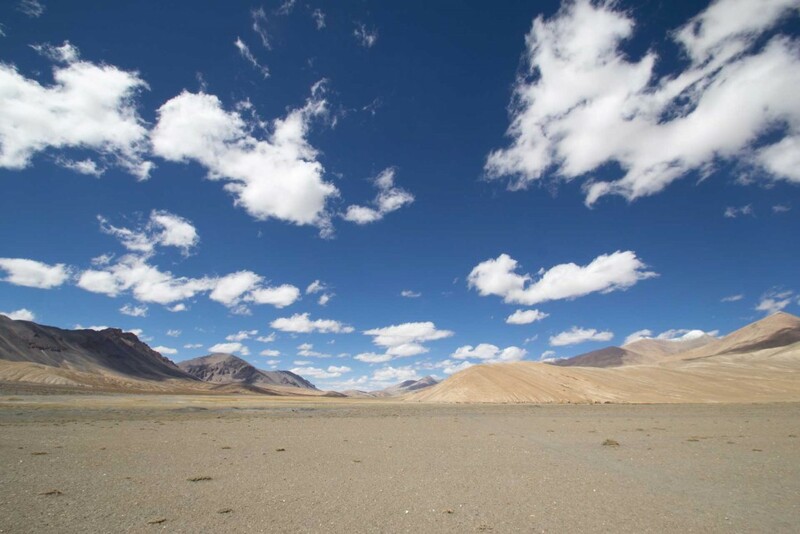 If you have a healthy pair of Lungs for adapting to the average altitude above 4500m, you need not be the muscular type as we are on a plateau, it is rather flat than other parts of of Ladakh with deep gorges, canyon and steep vertical passes. The area is also home to many peaks above 6000m with attractive summits besides home to some of the rare and endangered Mammals and birds dwelling on the roof of the world. The turquoise blue colour Lake Tsomoriri, embedded between the snowy mountains is where we end our trek and drive back to Leh. Somewhere in the past Ladakh used to be described as the land where the part of your body in the shade freezes while the part exposed to sun is melting. A little bit of that exaggerated saying can be applied here but not every day. This trek can be combined with many treks in all the directions including the famed traverse into the Valley of Spiti via Kibbar pass and into Zanskar. 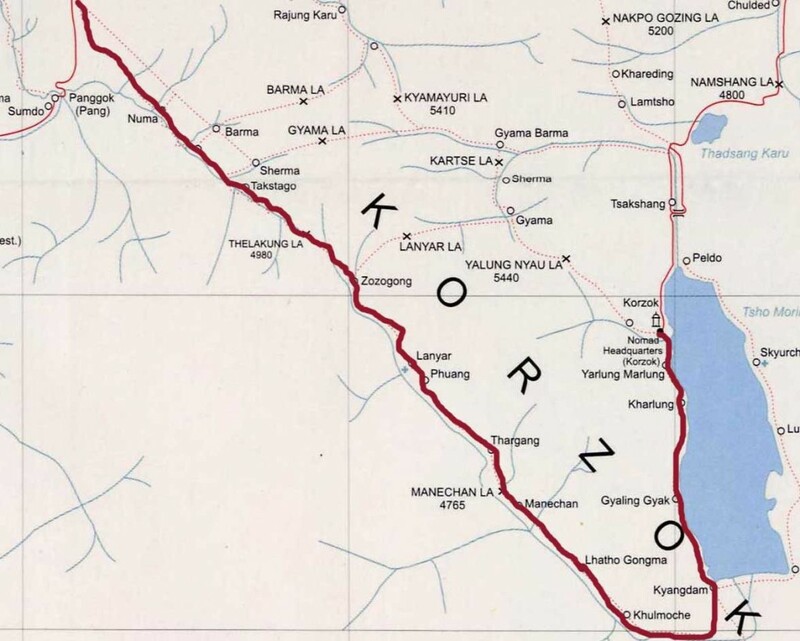 This tour is very often combined with the trek from Tsokar to Tsomoriri. It starts in beautiful Rumtse village below Taglang-Pass and leads quite fast up to an average walking altitude of more than 4.500m. So also here it is necessary to be well acclimatized before the trek starts. Enroute you will meet nomads with their flocks of yak, sheep and goats. A lesser frequented, very appealing trek that starts at Tsomoriri and follows it’s western shore. Gradual ascending, though one starts at above 4.500m and you never get below that altitude. Also on this tour one has the option of climbing mountains. Nomad’s camps and encounters with wildlife of the Changthang are the highlights of this tour. In the past it used to be almost 5 days trek till Kiupala, where we could begin the trek now. 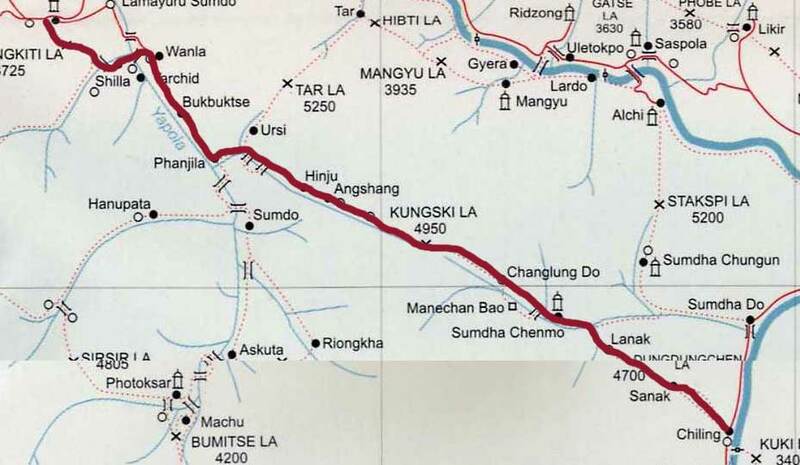 In the effort to connect the so called “far flung villages” in the Trans-Singela areas, a road is being built and someday, but not so soon, the villages will be connected to RACE with the world. However, we still do a combination of hike and drive from Lamayuru till Kiupala as acclimatisation. Beyond Kiupala, nothing has changed as yet. The only mode of transportation is on foot or with animals, unaltered since millennia. 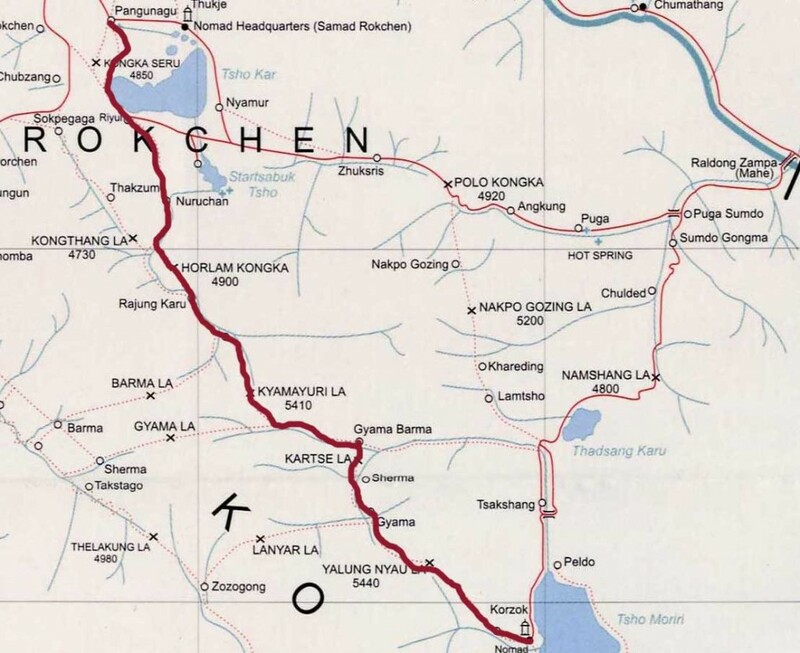 Some of the term usable for this trek is undulating, zigzagging and plunging through the idyllic Villages of Skyumpata, Lingshed, Zhingchen and Hanamur, and over Hanuma la and Parfi la passes. A trek for the tough and real mountain lovers. This tour can be done only by people in a very good physical shape due to the high passes and the partly very challenging water crossings. Additionally the remoteness of the area will require a good portion of willingness to take risks. But on the other hand you will be compensated with remote villages like Dibling, where time stood still. You will follow remote routes without meeting anyone (except the zanskari brown bear maybe). This is the toughest trek among the described ones. Extreme remoteness, between Shade and Sangtha one meets only sheperds (and eventually other adventurous trekkers), lot of water crossings, many passes. A great combination of Zanskar and the high plateau of Changthang, but truly not an option for people who put a lot of emphasis on safety. Here one has to have lot of love for adventure. Of course there are many more trekking routes but describing all of them would go beyond the scope. If you want to do any of these tours, or another one, just contact us. We organise all of these tours (and many others)! 1. The walking hours are average walking hours of not fully acclimatized tourists. Local people will be faster and also very fit people will be able to be faster. The times are approximate times without breaks. 2. All treks in Ladakh are treks in high altitude. A good acclimatization ahead is absolutely necessary. Please read our tips to avoid altitude sickness. 3. 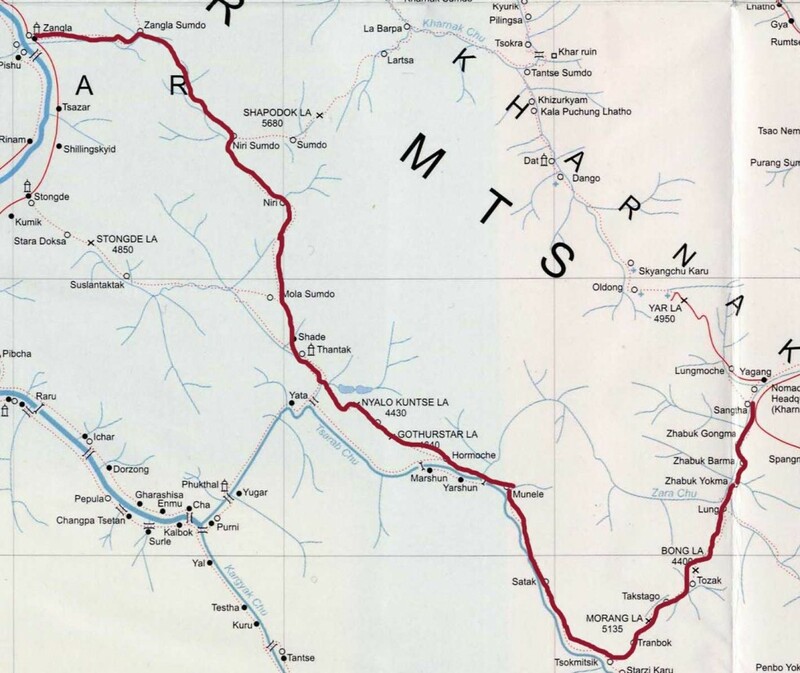 The maps shown here are from the map “Trekking in Ladakh” by Sonam Tsetan and Henk Thoma.